Yesterday you saw a sneak peek of Baby Girl’s Nursery which I used Cutting Edge Stencil’s newest design, the Large Chevron. Now today I have the chance for one of you guys to win a stencil of your choice up to a $50 value!! If you’ve been thinking about trying a stenciling project yourself but nervous to take the leap I highly suggest you do it! Three of my all time favorite projects have been done using a stencil from CES, my stenciled curtains, my stenciled kitchen pantry and now baby girl’s ceiling. What’s so great about Cutting Edge Stencils is they don’t just provide high quality – long lasting stencils. They have an entire blog dedication to inspirational ideas, and stenciling tips and tricks that will help you tackle any project. For instance, if you have textured walls and nervous about tackling such a project, CES has a great post about how stenciling on textured walls. I also have a couple of my own tips from when I did my kitchen pantry about how to stencil on textured walls here. Their newest addition to the stencil family is their Chevron pattern and they have an entire blog post dedicated to it to get the ideas flowing with how you can bring chevron into your home. They also provide great informative videos like the one below that’ll help you get started on any project. There’s really nothing stopping you now. You have a source for inspiration ideas, a source for tips and tricks how to get the perfect results, and now a source to get your own stencil! Enter now for your chance to win a stencil of your choice! Are you guys ready to see one of my FAVORITE projects I’ve completed to date?! I’ve been working away in Baby Girl’s Nursery and a couple weekends ago I finished painting in here… painting the ceiling! You may remember a little bit ago I was talking about the 5th wall, and started to dream up the idea of painting Baby Girl’s ceiling. Well thanks to Cutting Edge Stencils I received my motivation and got to it! This is the 3rd time using a CES stencil and each and every time I’m so impressed with the quality and my results. Stenciling really does step up the WOW factor in any room of your home! I’ve also used their stencils for my stenciled curtains, and my stenciled kitchen pantry. Well I immediately had the idea of doing chevron on the ceiling and so I messaged CES asking if they by chance had a chevron stencil that I just couldn’t see on their website. Their response, “it’s actually the NEXT stencil we’re adding to our collection!”. That’s’ what I call fate people! They have it in both a small chevron, and the large chevron pattern. I choose the large stencil and knew once I received it, there was no turning back. I was getting my 8 month pregnant buns up on a ladder to do some serious painting! This is just a sneak peek (a pretty BIG sneak peek though!) But I am HEAD OVER HEELS in love with how it turned out! Honestly, I go in her room 500 times a day and just stare, and smile. It’s exactly what I was wanting for her room. If you follow me on Facebook and Instagram you know what weekend I tackled this project as I kept sending out updates. One so people knew I was still alive (like I said I was up on a ladder for a total of about 18 hours total that weekend) and two because I was just too excited to not keep posting teaser pictures. I was actually REALLY surprised how great the stencil worked. My ceilings are a textured surface, just as our walls they have a knockdown texture to them which makes painting a challenge, and makes stenciling very challenging. I almost started the project assuming I’d use the stencil in the beginning but then just as a guide and would end up taping out the whole ceiling to just be able paint it out. However the stencil worked PERFECTLY! I had minimal bleeds and it ended up being so much easier to use than had I spent the time taping out the whole design. I’m going to do another post filled with tons of tips and tricks of how I stenciled the ceiling because I did quickly learn things that made the process easier. But for now, let’s kick back our heels and just look at how ADORABLE my Baby Girl’s ceiling is! Now for some MORE good news! Come back tomorrow for a chance to win a FREE Cutting Edge Stencil, a $50 value!!! Visit their website here, and start searching for which one you’d pick and what project you’d do with it! So I’ll see you tomorrow for the giveaway! Does anyone feel like Christmas snuck up behind them this year? Well Merry Christmas Eve day to everyone! Today at the PB&J house, Billy is off at work for the day, through the night and into tomorrow. The military really doesn’t make it easy to celebrate holidays with family and friends. So Jackson and I are going to bake some cookies, possibly go see a movie! If we were back in Minnesota today we would be hanging out with both our families, and enjoying the family company. Instead we’ll find time to Skype with all the families today and tomorrow. Hope you have a WONDERFUL holiday and I want to leave you with some more fun pictures of our front patio holiday cheer. Be sure to come back on Wednesday for a sneak peek of Baby Girl’s Nursery and an exciting announcement! Look what my 4 year old and I made this weekend! My weekends easily fill up with work, projects and checking off my To Do’s but this weekend I set aside some time to spend some fun crafting time with 4 year old. 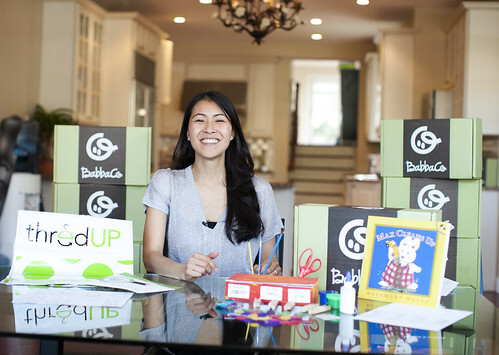 I recently had the opportunity receive a box of goodies from BabbaBox, and this fun kid’s craft is what we did with it! BabbaBox is a special delivery package that arrives right at your front door that comes with lots of goodies and ideas for craft projects you can do with your children. When the package arrived and I told my son it was filled with a fun surprise for him he was VERY eager to see what was inside. As you can see, each box is PACKED with goodies, and comes within a theme, ours was space and air. It had a fun toy for him, a special gift for parents, a great book, and two different craft projects. The greatest part about each craft project is that BabbaBox provides you with EVERYTHING you need for the project! There isn’t a single item in the project I needed to provide on my own – which is awesome and so convenient. We decided to make the Moon Nightlight, and as I mentioned it does come with everything you need, including step by step instructions. It’s easy to get wrapped up in my weekend To Do’s so I loved having a specific project that my son and I were able to do with the convenience of all the necessities right there for us. He had a blast getting his hands messy with the paper-mache and watching the “moon” glow once we were done with the project. BabbaBox is a box of creativity and inspiration that arrives right at your doorstep once a month and geared towards children 3-6 years of age. It helps inspire, drive and motivate kids to become hands on playing, while learning at the same time. Each box has four main components in it: Create (2-3 projects kids can do with their hands) Explore (a theme based product that’ll engage your child with the world and nature) Store Telling (curated books to stimulate your kids imagination) and Connect (interactive learning with prepaid downloads). A monthly membership is only $29.99 and they even offer a yearly membership which saves you more. And you can even save more a great holiday deal going on now! You can get 50% off your first month when you sign up for a monthly membership using coupon code SWAY 100 (Expires Dec 31st, 2012). Have you been wondering where in the world I am?! I'm here I promise!!! I've had so much on my plate lately I've felt like I can't get a moments rest. Want to know a secret that's bumming me out... I've been so busy I haven't decorated for Christmas yet!!! Do you ever feel like coming up with lavish Christmas decorations can’t be for you because of the crazy high cost of filling your home with beautiful decorations? It can be overwhelming to see beautiful landscapes on tables, topped off mantels, and filled up Christmas trees but all you see is expensive dollar signs! 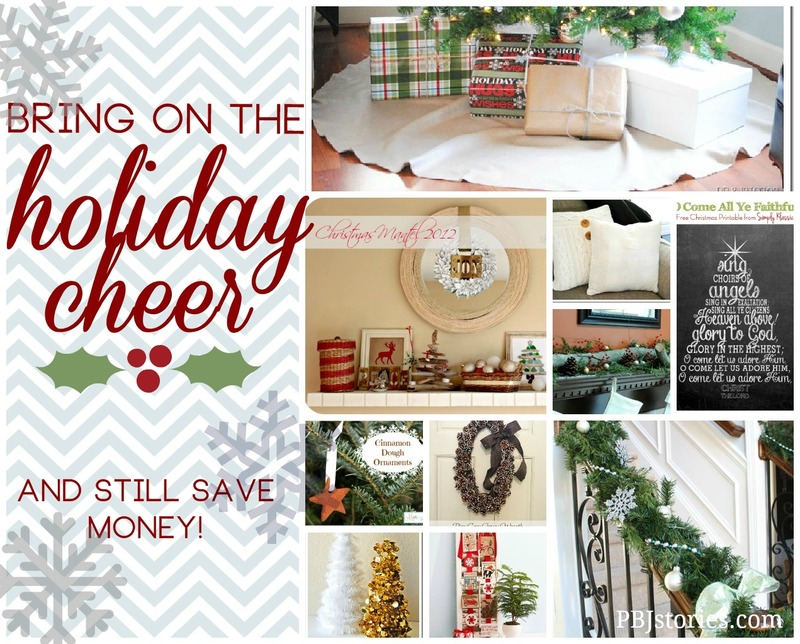 I wanted to come up with a few inexpensive ways we can save money, but still fill our home with beautiful decorations for the holidays. There’s multiple ways to decorate but still be budget friendly on your wallet such as using thrift store repurposed items, bringing in nature as key decorating elements, and even using your own day to day items in your home just redressed with some Holiday spirit. Throw pillows are a super easy way to fill your couch with holiday spirit, but store bought ones can add up fast. Change out the covers for DIY holiday inspired ones to keep the cost low. Tree skirts can have a high price tag, and I have always been a fan of simple pieces so I turned an inexpensive table cloth into our tree skirt. Using inexpensive tinsel and paper cones I made beautiful new Christmas trees that can fill my mantel with ease. Here’s a few other ways to decorate your home for the holiday season without breaking the bank on decorations. Using thrifted items and repurposing them during the holiday season is one of the most inexpensive ways to fill your home with joy! Kelly used her own tree clippings from her yard to add volume and texture to the simple dollar garland that never fills a space well. She has some great tips where to find tree clippings if you don’t have the right trees in your own yard. I love wreaths as holiday décor but they can cost a pretty penny. DIYing your own is the easiest and most inexpensive way to impact your front door. Bonnie uses inexpensive materials to create this beautiful wreath that would be a high cost item if you purchased it new! Can’t find any dipped pinecones in the store? You could even use ones from your backyard and dip them in your own paint! Ornaments can be a high investment to fill your tree. Jessica made these cinnamon dough ornaments and filled her tree with beautiful new ornaments with little to no cost to her wallet, and also filled her home with that holiday cinnamon scent too! Back to using nature as a main source of décor pieces! It’s so simple, inexpensive, makes a huge impact and smells great! Jenna uses a old tree log and makes it into a mantel piece that holds candles. She has repurposed this piece over and over again between her mantel to her tablescapes, using it for multiple holidays too! It is such a versatile piece and looks great. Printables are another way to add beautiful new pieces of art that are inexpensive, but make a statement. Kristin shares her free printables for the Holiday season on her blog, I love this one, plus she share a couple others. 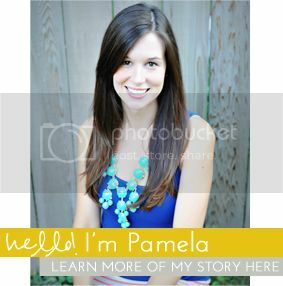 Simply visit her blog and download the piece and have developed to the size of your choice. Place it in a frame and you have instant beautiful inexpensive art thanks to her! Now to start using my tips and advice and make it time to start decorating this weekend for Christmas!